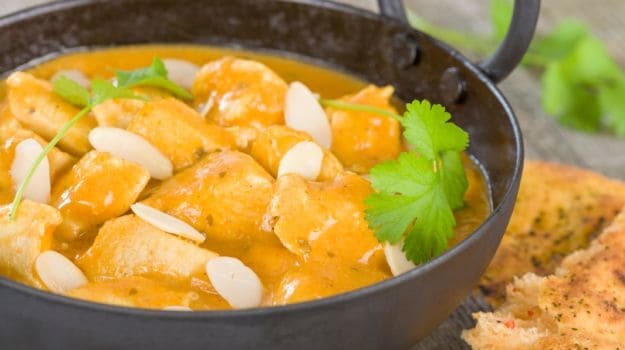 Best Chicken Curry Recipes- If your definition of comfort food is chicken curry and rice then you will know the importance it holds among millions and millions of people. 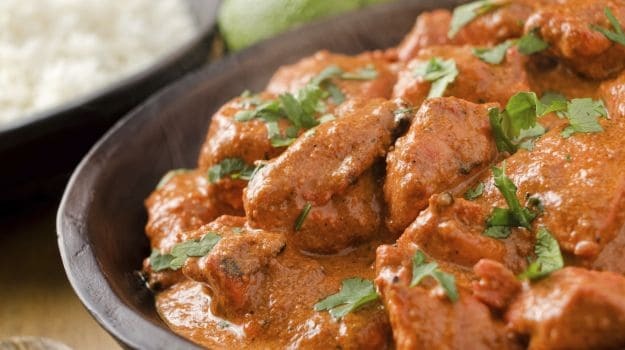 Whether it is butter chicken, kadhai chicken, chicken tikka masala, home-made chicken korma or chicken gravy recipe, each dish is unique and caters to different taste buds. Succulent chunks of chicken simmering leisurely in a feisty gravy, sending off an inviting aroma that just cannot be ignored. A chicken curry is the ultimate crowd pleaser and an absolute must-have on an Indian dinner party menu. 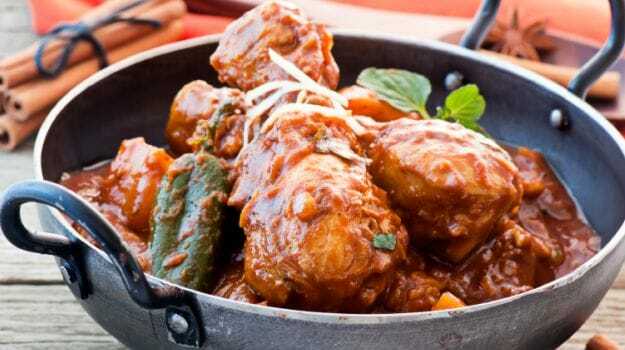 India boasts of various flavours of chicken curries from different regions. The great Indian'kari', which stems from the word for sauce in Tamil, is known to have originated sometime during the ancient Indus civilization. Since then it has travelled beyond boundaries and created many fans across the globe. 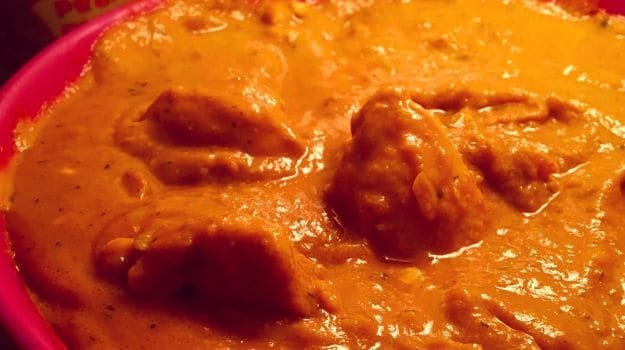 And Britain's love affair with 'curry' is no secret - chicken tikka masala is the most popular restaurant meal in England. The curry adopts different flavours as you walk across regional boundaries. It is a bold base that adds depth and interest to the any dish. Robust, velvety, brilliantly buttery, creamy, tangy - every state boasts of a different version of chicken curry recipe. We love the versatility that Indian curries offer. In Northern and Eastern India, you'll be served a hearty curry bursting with garam masala and other spices along with crisp naans. As you move towards the west, warm notes of poppy-seeds, cardamom and khada masalas dominate the dish that sits atop a bed of steaming rice. From down South, comes a soothing coconut-y concoction with the addition of coconut milk. The cooking medium of different chicken gravies also differ as per local tastes. For instance, ghee (clarified butter) or vegetable oil is used predominantly in North India and coconut oil lends it unique flavor to Southern curries. Mustard oil brightens up the curries from East and the West is known for the heavy use of sesame and groundnut oil. You'll have to agree, cooking a chicken curry recipe is a skill. The meat should be cooked delicately and can be bathed, steeped, stewed or simmered in the gravy. Once the oil starts separating, you know your base is ready. It's good to cook the chicken separately and then add it to the base allowing the rich and redolent flavours to seep through. A perfect chicken gravy recipe in its full glory is nothing short of a masterpiece. A fiery curry with a coconut base. The highlight of this chicken curry is the freshly-made malvani masala. 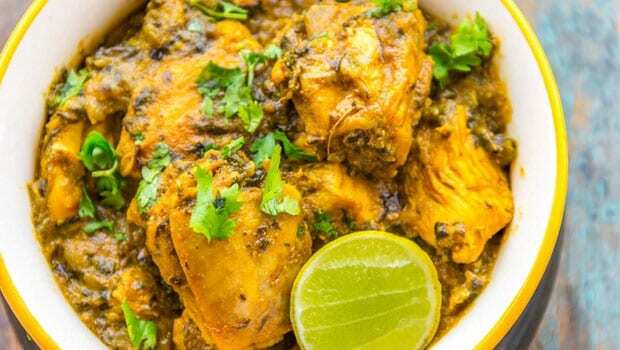 A perfect recipe for all the spice lovers out there, Malvani chicken curry is a hot, delectable chicken recipe from the konkan region of Maharashtra. This is sure to leave your taste buds tingling for more! 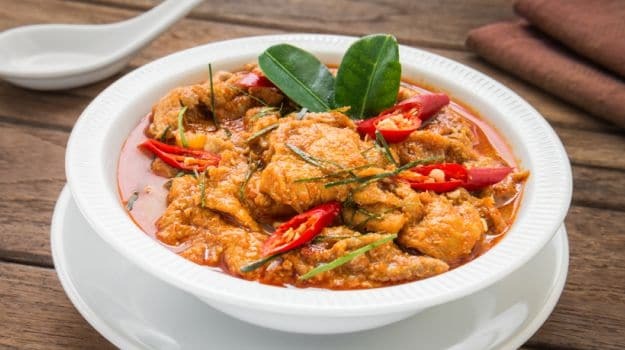 This Chicken Curry Recipe is a fiery curry with coconut base from the Malvani cuisine of Maharashtra. Thick, curd based chicken curry with a melange of spices and chicken breasts tossed together. Pair with rice or chapati and have a whole meal for a dinner party. This is one of the most ordered restaurant meal across the globe. Need we say more? Creamy, spicy, luscious and garnished with coriander leaves, this chicken dish will leave you asking for more. This one's a keeper. 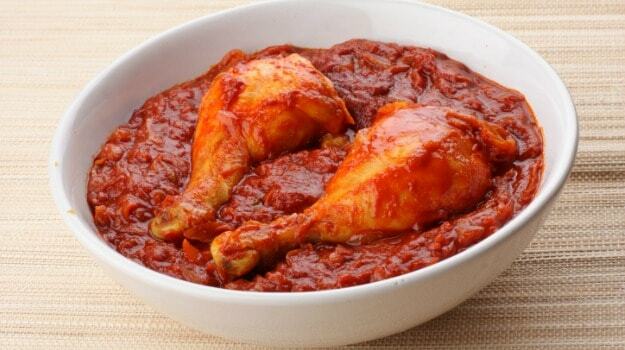 Marinated overnight, the chicken is roasted and cooked in tomato puree, cream and masalas. A perfect dinner party recipe, this North-Indian style chicken recipe is made throughout the country with equal zest. Here's a brilliant from one of the most popular restaurants in the Capital. A squeeze of lime makes everything better. A tangy, spicy chicken dish to prepare for a dinner party or casually at home. It's a different yet super quick and easy chicken recipe. Prepare for a dinner party and pair with any Indian bread or cooked rice. Chicken laced with a taste-bud tingling mix highlighted with lime and chillies makes this chicken recipe a hit. A popular chicken dish in Kerala where it is affectionately called as 'Ishtu'. A popular Bengali curry with Mughlai origins, Murgh Rezala curry is rich and robust. Made with boneless chicken, cashew nut paste, khoya and coconut, Murg Rezala is an absolute treat and just perfect to prepare for a dinner party. Murg Rezala is one of the best Bengali Chicken curry recipe with a perfectly balanced dish. It is neither too sweet, sour or spicy. Sali Marghi is an age-old Parsi preparation. 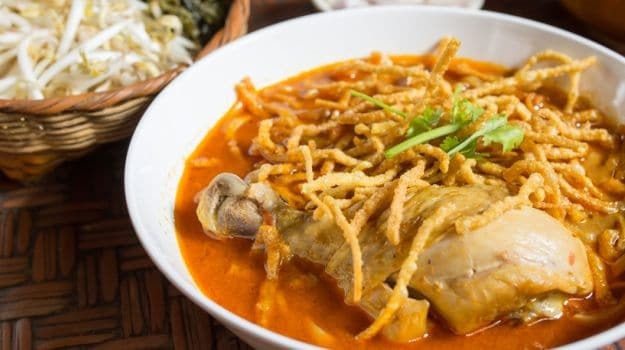 Chicken cooked in a tangy tomato gravy and topped with crisp, fried potato strings. 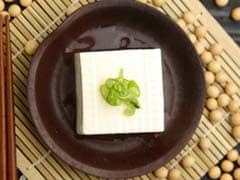 This can be a great side dish or even a delicious main dish at a dinner party when paired with rice. A delicious chicken recipe to cook at home and feast on with friends and family. This recipe uses double the quantity of onions used in a regular curry, thus the name. A Punjabi favourite with freshly-made garam masala, ginger-garlic, kasoori methi, cream and a host of spices. The use of onion imparts a subtle sweetness which is balanced with a variety of spices. This chicken recipe is a delight for chicken lovers and also who loves spicy food. The spiciest chicken curry of them all! Don't blame us when you have fiery spices strolling down in tears but the taste buds aren't done yet. Chicken Xacuti is a Goan delicacy. It is a very spicy curry with chicken chunks cooked in a medley of local flavours like coconut, cashews and white poppy-seeds. A distinct chicken curry recipe that will be best paired with rice for a dinner party. Chicken Xacuti is a Goan delicacy and makes for the best local dishes you would want to try. Kolhapuri cuisine is known to be spicy and full of flavour. This dish is no less, chicken curry cooked with a special Kolhapuri masala that uses bold flavours of peanut oil, bay leaf, black pepper and cloves. 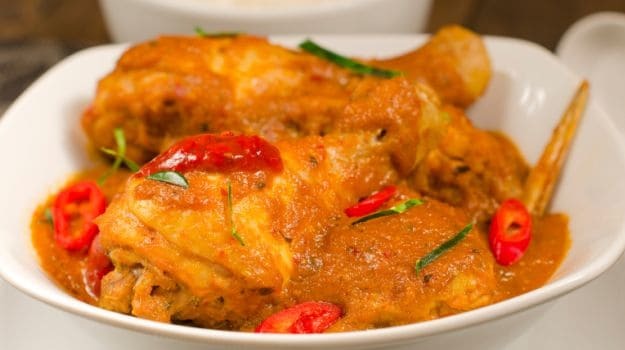 The unique flavour in this chicken curry comes from the fresh ground spices and grated coconut. Chicken curry cooked with a special Kolhapuri masala is something you must try Served with hot, steamed rice or any Indian bread of your choice. Saving the best for the last! 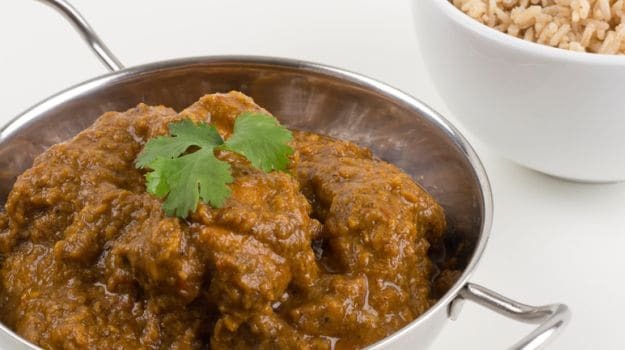 An authentic Punjabi dish, Amritsari Chicken Masala is a delectable chicken recipe that is flavored with fresh cream, butter and fresh tomatoes. Hugely famous in Indian restaurants, you can easily cook this at home with our simple step by step recipe. The delicious dish can be made easily at home as it does not require too many ingredients or Indian spices. 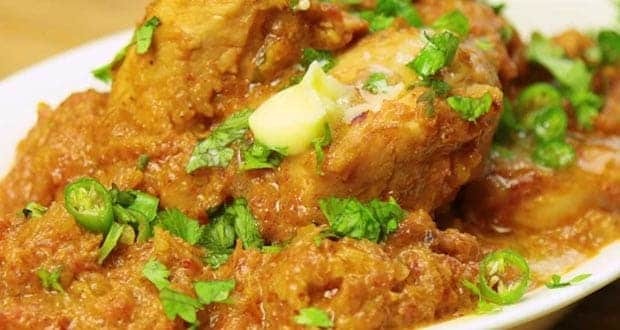 If you have been craving for a plate of chicken curry and rice, you know now how to dish out a plate at the comfort of your home and within a few minutes. 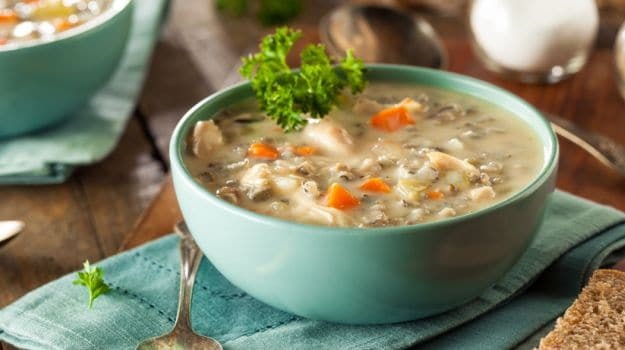 It is simple and doesn't require much effort, and the flavours are sure to bowl you over. Butter Chicken And Naan Are Being Served As 'Indian Taco' In NY, And People Aren't Pleased!